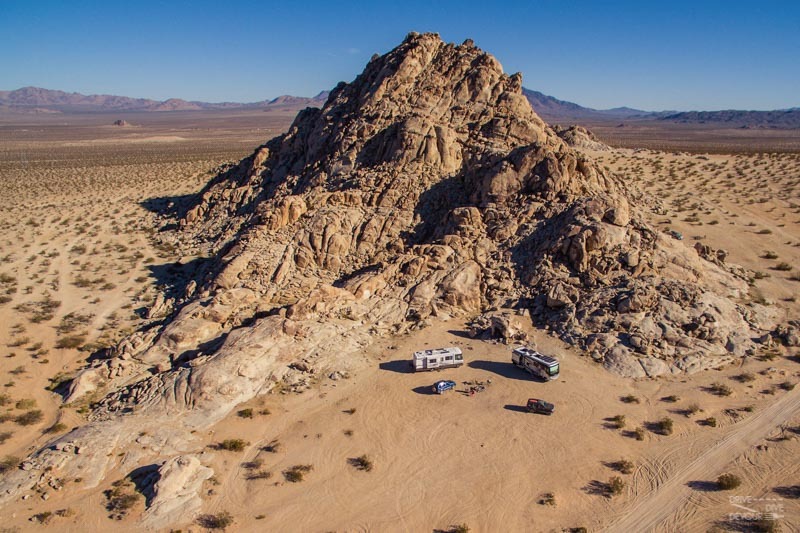 When we started looking into full-time RVing, boondocking wasn’t even on my radar. We had been tent camping and had a pop-up we took out on the weekends, but I think in my mind, off-grid camping meant hiking into the forest and pitching a tent. This wasn’t somewhere a larger RV or even our small pop-up could go. So when we started researching RV set-ups, solar didn’t factor into the equation. Fast forward a year into our travels and things changed. We were more aware of the possibilities laid out before us. We spent our first year mostly around the East coast, land of RV parks and paid camping. 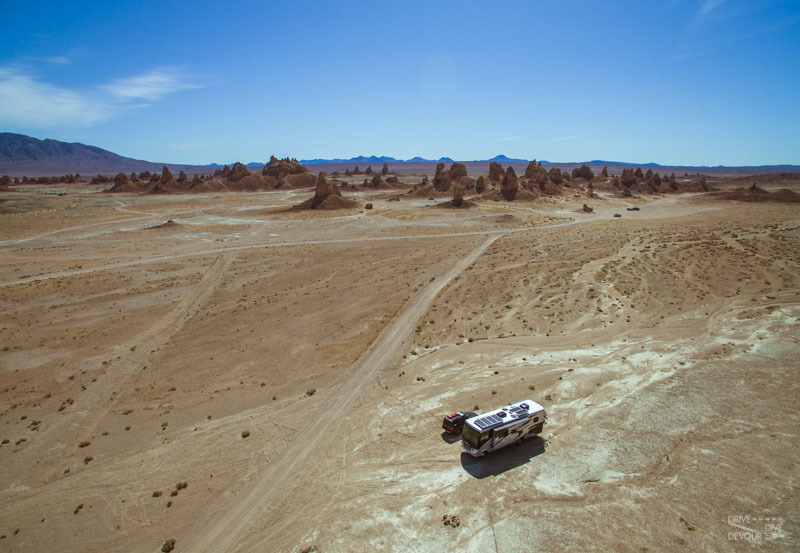 Some of our friends, meanwhile, had moved west and shared pictures of their rigs in the desert and other amazing places alone and untethered. We viewed them longingly while we were anchored to power poles. Yes, we had a generator and could run it if needed, but our big rig was a power-hungry beast. We didn’t want to make lots of noise for the sake of any neighbors and our own sanity. Overnight was ok, but anything longer than that or trying to work and we had to fire up the genny. 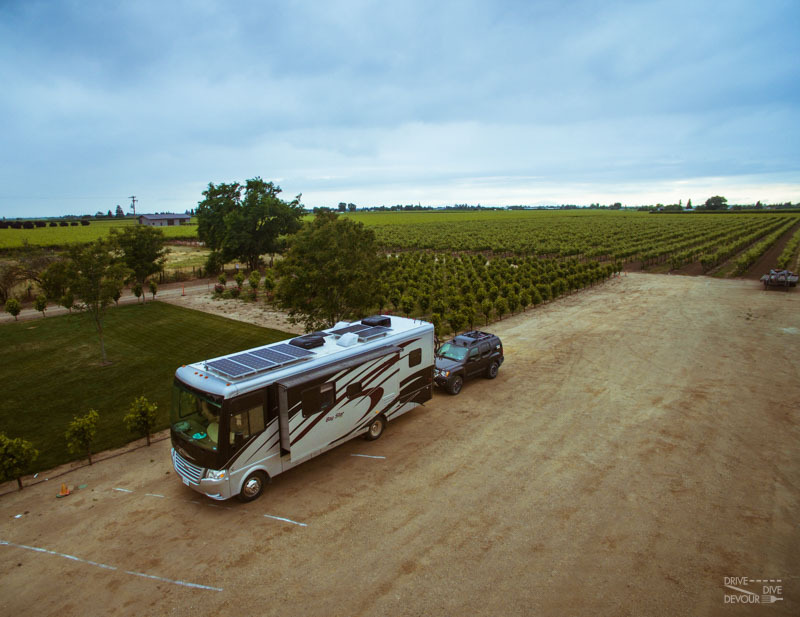 There were a few reasons we didn’t feel adding solar to our previous RV was the right decision one of which was the nagging feeling we weren’t keeping her much longer. After deciding to go smaller and lighter, solar became part of the plan. 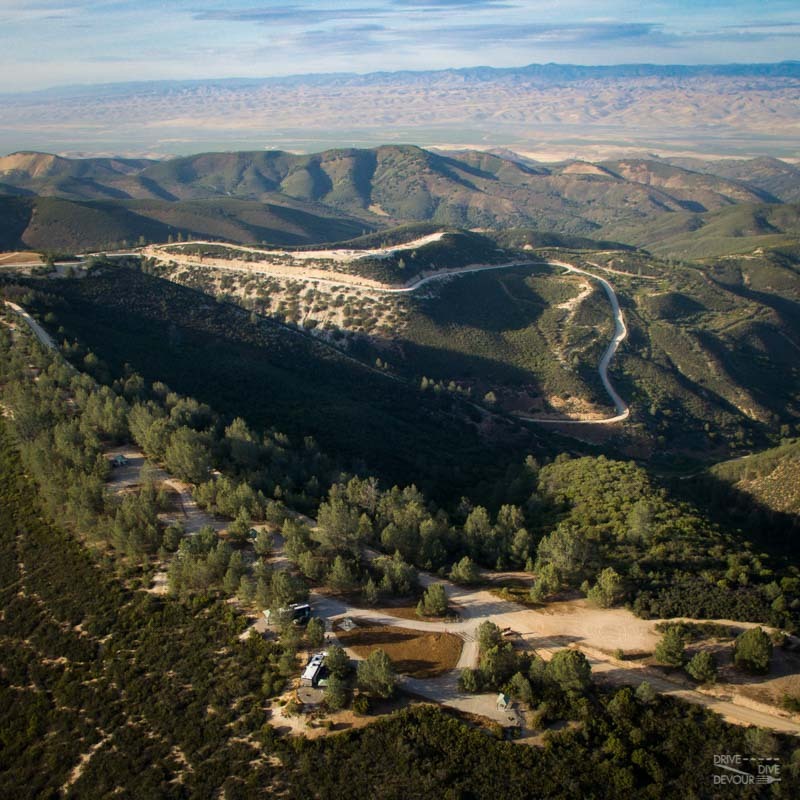 We purchased our new RV with the intent of making it off-grid awesome. As with most RVs, it was off-grid capable, but we wanted it to take it up a notch and have enough power to not run the generator unless truly needed. We split our install into two parts. First, we upgraded the batteries giving us more amp hours capability and had a new, robust inverter installed. Only the TVs were wired to the previous inverter, but that wouldn’t cut it for these working full-timers. We had everything except the air conditioners wired to the new one, so we can work on our computers even while in the middle of nowhere. The batteries gave our power supply enough boost that we could go much longer before running the genny than previous attempts. But we weren’t finished and completed our new set-up when we had the solar panels installed on our next visit. This changed our game completely. Now, we could work all day and night if needed. I could run my instant pot or Brandon could watch a little Netflix. And we could do it all with the power from the sun and not attached to a power pole. Once the solar panel installation was complete, we drove our RV straight to Quartzsite, the 2nd Xscapers convergence, and some other friends in the area. What a change! During the 1st Xscapers convergence with our old rig, we had to run the generator twice a day just to keep up with our power needs! Now we were sitting quietly, soaking up the sun with friends and more thoroughly enjoying our wild camping experience. 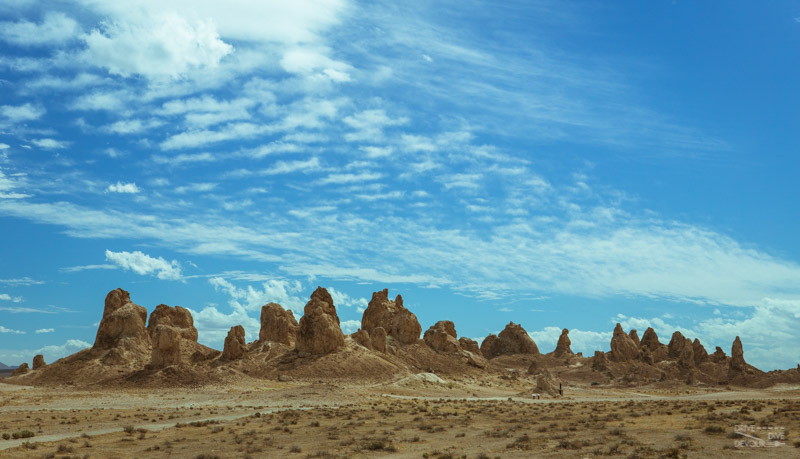 Wild camping out in BLM land like Trona Pinnacles and Johnson Valley. 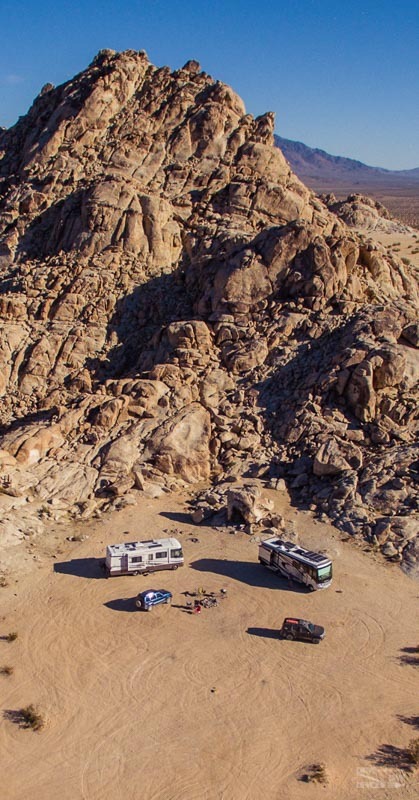 At a BLM campground with no hook-ups. We shot, edited, and wrote our RV video tour post there all while on solar power. At a county park where we chose the dry camping spot in a secluded loop rather than packed in the full hook-up area (cheaper, too!). On a rainy day at a Harvest Host. We weren’t making as much power as normal, but we still pulled through without having to turn on the generator which would have been awkward during retail hours. We even decided to have a movie night with friends in the dry camping area of an SKP Co-op. For us, the benefits of solar have far outweighed the cost. And since we’ve been on the California coast for a while with mainly RV parks around, we’ve barely scratched the surface of using it. We’re looking forward to traipsing across the country this summer soaking up the rays. The panels are mounted to a custom rail system created by Starlight Solar. This allows the panels to sit a little higher on the roof so they aren’t affected by shadows from the air conditioners, etc. There are fewer holes in the roof, too, since each panel isn’t mounted individually. Our previous RV had a 2000 watt inverter that was not pure sine. We had it kill a couple of electric heaters that were plugged in, but not even turned on so we knew we wanted to have a pure sine inverter this time. Knowing we could function well on 2000 watts, we knew the 2800 watt inverter would fit our needs just fine. Our charge controller is the new one that Magnum just released. The multi power point means it can adjust the way it charges the batteries in varying solar conditions without wasting too much of the incoming solar electricity. This was a relatively inexpensive feature that was easily added to our inverter set-up. The auto gen start has many functions, but the key functions for us are that it can turn on the generator if the batteries get too low and it can turn on the generator to run the AC if the interior gets too hot. This last point is critical for us with pets in the RV. Since the AC is not wired to the inverter, we can leave the AC set to on and it will not run, but if the interior temp gets too high, the generator will start automatically and then the AC will come on. Once the AGS sees that interior temp has dropped it will turn off the generator. Our new rig originally had two house batteries located in the front engine bay. The guys at Starlight Solar found a welder to create a new rack to mount two more batteries in the bay. These are wired in pairs to give us 500amp/hrs at 12 volts. Since we want our batteries to last a long time and maintain their performance, it is a good idea not to discharge them more than 50%. This means we effectively have 250 amp/hrs to use before we need more sunlight or the generator has to come on. Our RV is just a year behind having LED lights standard, so we changed out all our bulbs ourselves. This has dramatically decreased their power consumption. What does this mean in the real world? Once the sun starts to get low in the sky and the solar panels are no longer receiving enough sun to charge the batteries we can use our computers and watch one of our large TVs until 11:00 pm and the batteries will still be 70-75% charged. If we turn off the inverter overnight, the batteries may only drop 1-2% more. If we are lazy and don’t want to get out of bed to turn off the inverter, then the batteries may drop about 5% more. Once the sun rises in the morning, the solar panels will start charging the system back up. By 10:00 am or so, the solar panels are already making enough power to keep up with our computers while also applying some charge to the batteries. If we continue working while the solar is charging, then we will probably be back up to 100% by 1:00 pm. Then the batteries will stay at 100% until the sun gets too low again. If it rains for a week straight, we can limit our electricity use more and run the generator for a couple of hours to charge up the batteries as needed. It’s nice to have options! Also, if we don’t use the inverter at all and just use the 12 volt system to run the fridge, lights, water heater, and to charge our phones, then we can go 3-4 days or more relying solely on our batteries even if we get no solar charge at all! If you think the above makes it sound like I know what I’m talking about, thanks. I don’t really, but the guy at Starlight walked me through the logic of it all and in the end I agreed with him and we are very happy with our solar setup. It’s probably a bit much for people who aren’t working in their RVs all day, but it seems just about perfect for us. 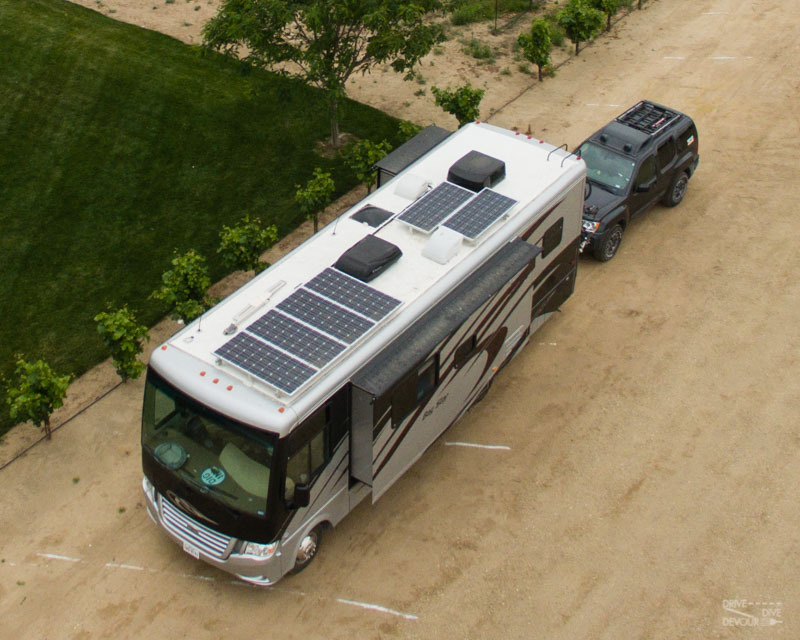 There are many variables that go into an RV solar set-up. Research and choose the best set-up for you. *Disclaimer: This post contains Amazon affiliate links. The price for you does not change, but it helps support this website with a few pennies. The solar panels for this post were partially sponsored. As always, our opinions are completely honest and our own and cannot be bought, sold, or swayed. 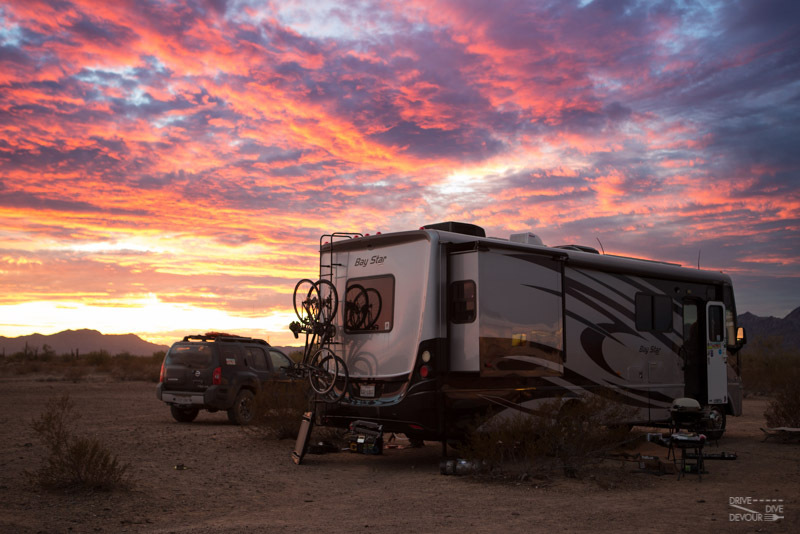 « If the RV is Rockin’ – Try Anti-Sway Bars! I’m just curious of the total cost for what you did. The first part of the installation included the new batteries, welding a bracket, pre-wiring for the solar, the new inverter, labor, etc and came in around $6000. The second part included the panels, the rail system, charge controller, more wiring and labor and was over $4000. It’s not cheap, but we feel we made an investment in our happiness and for future returns. We hope to boondock more and spend less in park fees. Thanks so much, Gary, much appreciated. We hope you learned a little more through the post. We’re loving our solar. We haven’t been plugged in for a good stretch now and it feels great! Do you mind saying what brand and model of refrigerator you have? We have a Norcold N811 that is 7.5 cubic feet. It came standard in our RV. The automatic generator starter sounds like something I need for tailgating with the pets. Even if I don’t go solar. I’ve always been told to wait a few seconds/minutes to start the air conditioner after starting the generator. Are you worried about power surges or damage to your equipment by using the automatic starter? Our Dometic thermstat waits a few seconds before kicking in the a/c, so we’re not too worried about that. I love the setup you guys have, I was considering doing the same to my RV and I think this is gonna make me do it! Awesome! We’re very happy with ours.